The Magic Card V2 is a two-part accessory for the Sega Saturn, allowing the system to play "backup" versions of Saturn software. It is an alternative to physical modifications which bypasses all of the Saturn's anti-piracy and region locking mechanisms. It assists in doing the swap trick by stopping the disc from spinning at certain points, and providing on-screen instructions on when to swap discs or reset the console. 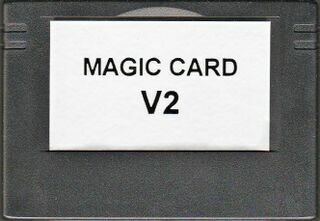 The Magic Card V2 is a very rare item and comes in two parts - a cartridge and a disc, both of which are required to achieve the desired effect (although any retail Saturn disc can be substituted for the Magic Card V2 disc). At present it is not known who made the Magic Card V2 (or whether there was a "V1") - it was not endorsed by Sega, and copies often retail for significant sums of money second-hand.